Ocean Knight can take another step to the Caulfield Guineas when he runs in the Danehill Stakes. The Lindsay Park team is relying on promising colt Ocean Knight to deliver the stable a second-straight Danehill Stakes at Flemington. Star filly Catchy won the Group Two Danehill a year ago and senior trainer David Hayes has high hopes for Ocean Knight who is being aimed at next month’s Group One Caulfield Guineas (1600m). Like Catchy last year, Ocean Knight will have Regan Bayliss aboard on Saturday and Hayes believes the colt will handle racing on the straight 1200m-course having impressed the trainer in a jump-out early last month. “We’re hoping he’s a Guineas contender and I think he’ll really sprint well up the straight because he trialled very well up the straight,” Hayes said. Ocean Knight settled last in the Listed McKenzie Stakes (1200m) at Moonee Valley first-up before hitting the line for fifth. “It was a day they didn’t run on and he did,” Hayes said. 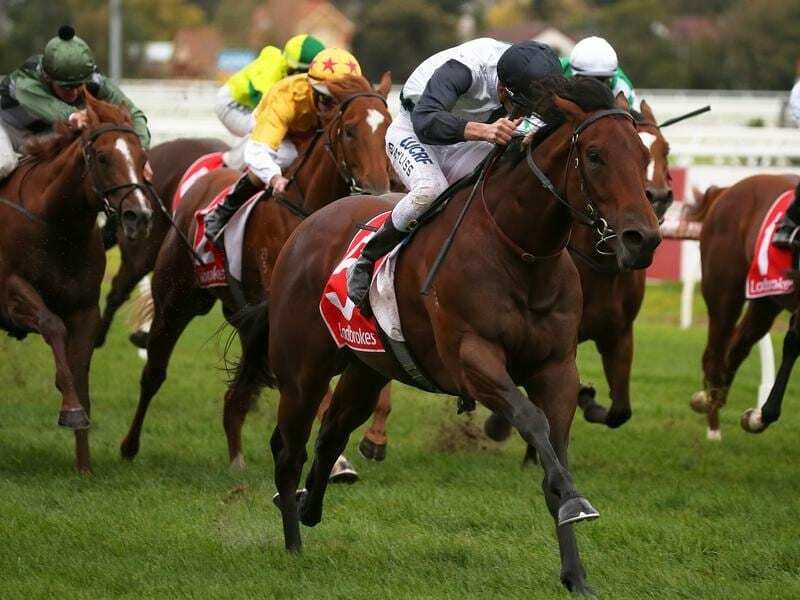 The Hawkes Racing-trained McKenzie Stakes winner Brutal is not among Ocean Knight’s Danehill rivals and instead headlines Saturday’s 1400m-Listed race for three-year-olds in which Lindsay Park has three runners. Stakes winner Good ‘N’ Fast begins his Caulfield Guineas preparation while Qafila can press her Thousand Guineas claims after a pleasing first-up fourth in the Quezette Stakes. A Fighting Fury comes off two synthetic track wins and Hayes said he probably needed to lift. “Good ‘N’ Fast has been going as well as (Wednesday’s Bendigo winner) Mickey Blue Eyes so I think he’ll run well,” Hayes said. Hayes indicated Qafila would probably have to settle back from her wide draw. “I think we’ll just let her balance up and swoop home,” he said.